Ultimo Guerrero, who had been working as Mictlan all evening again, attacked Atlantis from behind. In a completely by the numbers match between the two of them, UG took falls 1/3 to get the win. 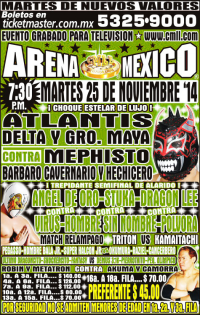 Mephisto replaced Barbaro Cavernario. Dragon Rojo's return from injury. Tecnicos took 1/3. Sombra used the ropes to beat Terrible in the first. 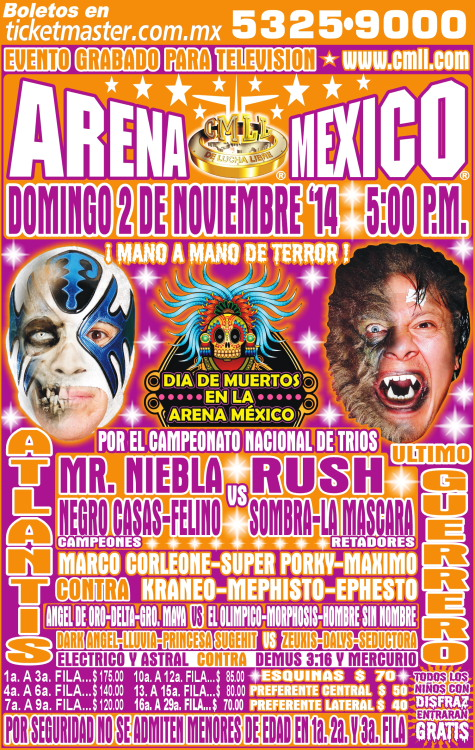 Panther submitted Mephisto & Rey Bucanero in the third. Bobby Zavala replaced Pierroth. Sagrado pulled Maya's mask for the DQ. 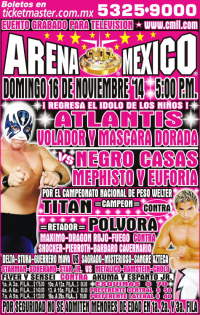 Titan replaced Maximo and Polvora replaced Rey Bucanero on Monday. Polvora beat Titan to set up a title match. 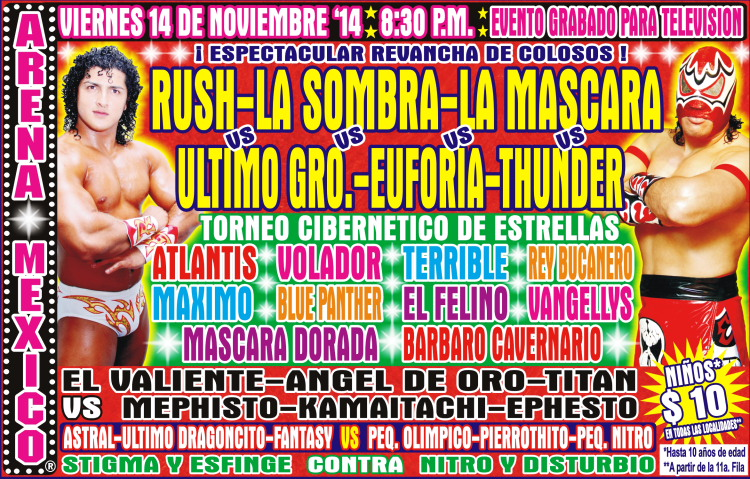 Dragon Rojo replaced Titan and Thunder replaced Polvora on Monday. Volador was about to beat Mephisto with a backcracker, but Mascara gave "partner" Volador a backcracker to give Mephisto the win. Volador & Mascara did not get along the entire match. Aereo was stretchered out after taking a Mercurio piledriver. Lluvia replaced Dark Angel. 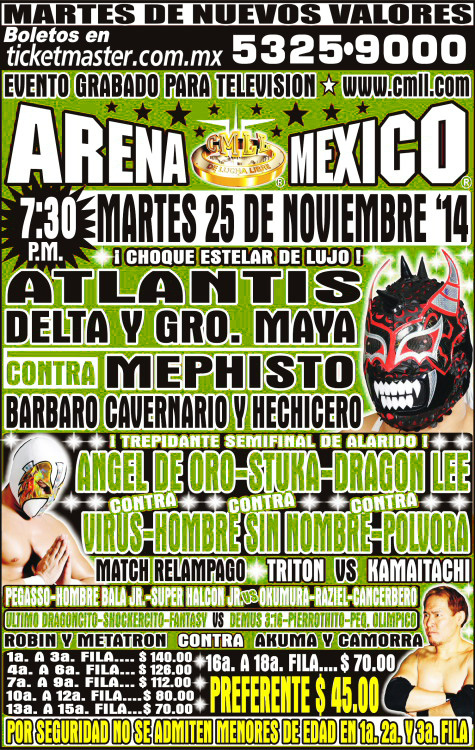 Tecnicas took 2/3, Estrellita pinning Zeuxis clean in the third - which somehow sets up Zeuxis getting a title shot. Polvora won with an anti-air dropkick in six minutes, and said the same owuld happenon Sunday. Tiger & Puma replaced Gran Guerrrero & Misterioso on Tuesday. Tecnicos took 2/3. Shocker replaced Mr. Niebla. Rudos took 1/3, Shocker using the ropes to beat Panther. 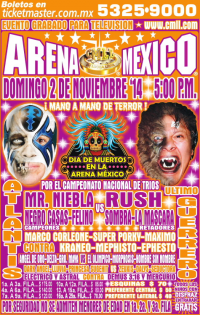 Shocker, Felino and Panther made challenges. Tecnicos took 1/3. Angel de Oro beat Mephisto with help of the ropes after Mephisto had twice tried to the the same. Kamaitachi looked good. Chavo Guerrero Jr. & Hernandez appeared in the ring after this match, promoting the All Elite card. Hechicero replaced Vangellys. Tecnicos vs rudo sides. 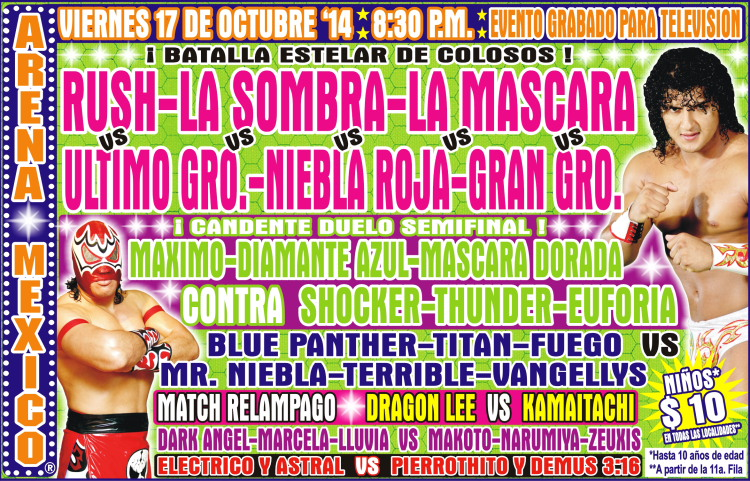 Eliminations went Hechicero (Dorada), Atlantis (Terrible), Dorada (Cavernario), Panther (Cavernario), Cavernario (Maximo), Felino (Maximo), Maximo (Bucanero), Terrible (Volador) leaving Rey Bucanero and Volador. Terrible came back in to foul Volador while the referee was distracted, and Bucanero go the pin. Volador, Maximo, Bucanero, Terrible, Felino and Cavernario brawled and argued, tecnicos against rudos. Straight falls. Marco Corleone replaced Rush (broken leg) and fought as if he was a new Ingobernable - only Mascara & Sombra disrupted the count when he had UG beat. Tirantes cleared them out, and UG snuck in a foul on Marco for the win. Marco challenged UG to a hair match, and UG declared Marco loco. Titan took falls 2/3 to retain the title in a very good match very reminiscent of his title win versus Averno, including crashing and burning into the barricade on a tope and being brought in to take his opponents finisher, only to kick out. This collision looked even worse. Titan pulled out a La Mistica into a cradle to keep his belt. 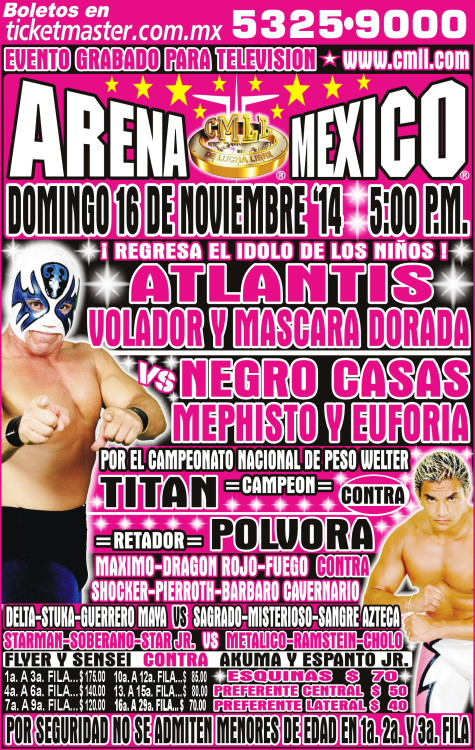 Titan's sixth defense; he'll almost certainly reach one year as champion on 12/01. Okumura replaced Zavala. Raziel pulled Triton's mask for the DQ. 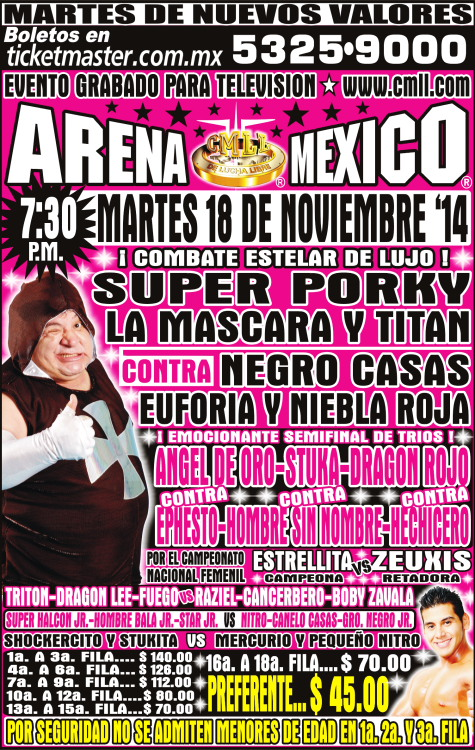 Super Porky replaced Mascara Dorada. Shocker declared he didn't want to be in the cage match and wanted to face Maximo in a singles hair match instead. Shocker beat up Maximo and beat up Porky when he tried to make the save. Cachorro debuted his the Panther name. 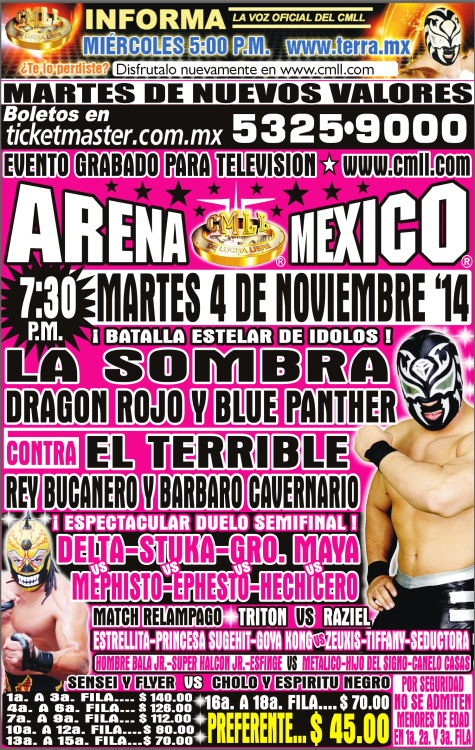 Rudos took 2/3, with Oro Jr. taking Tiger's Destroyer badly and being stretchered out. Arkangel & Canelo Casas replaced Cancerbero & Raziel on Monday. Kamaitachi won in about 7 minutes with a German suplex. Sangre Azteca replaced Polvora. Tecnicos took 2/3. Dragon Lee beat Virus. Reyes del Atlantida took 1/3, the last when Barbaro desperately fouled Maya. Dalys missed the bodybuilding contest on doctor's orders but was back here. Estrellita was taken from the match in the second fall after being injuring her back on a Dalys piledriver. 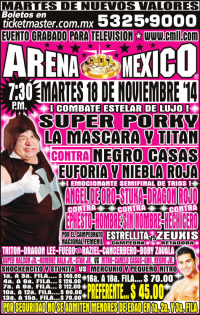 Super Porky was last out and Felino and Bucanero needed help leaving it after the last match. Maximo was mentioned live as being hurt by Vanglleys but there's nothing in the recap about it. Tecnicos took 2/3, the last by excessive violence. Ramstein & Cholo feuded heavily with Star Jr. & Soberano Jr. and were DQed for refusing to stop beating him up. Triton replaced Pegasso on Monday. Rudos took 1/3, Pierroth beating Stigma with a powerbomb cleanly. 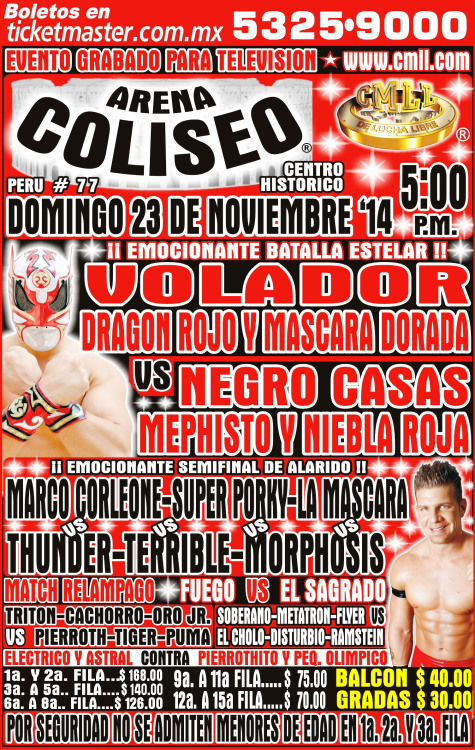 Volador took 2/3, the last with the top rope huracanrana for the win. There was a fire drill immediately following the match.